The entire world gets a major case of Pac-Man fever, and video games get their first true superstar. 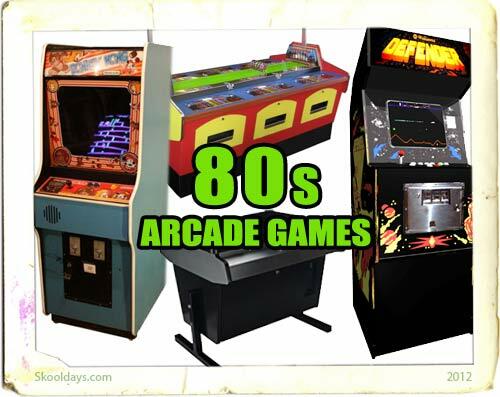 Video takes the arcade into a new golden age, riding on the shoulders of giants like Donkey Kong, Defender, Centipede, Frogger, Galaga, Q*bert and the Pac’s little lady, Ms. Pac-Man. If the video cabinets are booked for the next few hours, the arcade still has plenty to offer: the bubble hockey of Chexx, pinball greats like Black Knight, Haunted House and more. The arcade takes a tumble with the great video game market crash 1984, but hits like Gauntlet and Rampage show the way back, while the hard-hitting punches of Double Dragon and Final Fight point to the wave of the future. Does anyone remember an arcade game that was a little ninja climbing up, jumping on walls and also falling?? Can’t find anywhere and don’t remember the name. I think the name was a japanese word. Please someone help!! Was that the one with the neon green ninja? Or it had other color ninjas other than black or white. I have been looking for either the same or similar game for forever now. No one remembers it. I would spend forever playing the game. They had it at Showbiz Pizza and later at Chuck E Cheese. Is that the one with a big pit that you have to wall jump out of?